On Monday Chinese traders came back from their Golden Week break and chased the price of iron ore up 6% – the biggest one-day jump in the price of the steelmaking raw material since November. Another 6% gain on Tuesday brought it to within shouting distance of $120 – iron ore has now clawed back more than a third of its value since hitting a three-and-a-half year low of $86.70 barely five weeks ago. These kinds of price movements would have been unthinkable not that long ago. The 1 billion tonne seaborne iron ore trade is dominated by Brazil's Vale and Anglo-Australian giants Rio Tinto and BHP Billiton. 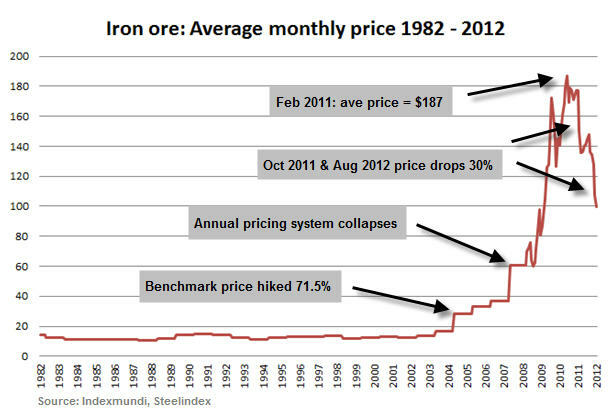 In the past the Big 3 would set the price through negotiated annual contracts which is why the price of 62% iron content ore never strayed from $10 – $14 a tonne for more than 20 years. The price jumped 71% at the start of 2005 to $28, but it would take another four years to December 2008 for this antiquated system to completely fall apart. The benchmark system fell apart after a period where traders were making more money than miners by picking up annual contracts and selling into what constituted the spot market at the time. The changes in the iron market also came about because China was ramping up consumption of the commodity in leaps and bounds – at the height of the financial crisis it picked up the rest of the world's slack to the tune of 250 million additional tonnes. The world's second largest economy today uses up around 60% of global supply as it pushes out steel at rate of two million tonnes per day, almost at the same rate as the rest of the world combined. China also has 100 million tonnes of ore in stockpiles sitting at ports. Now we're on the brink of another radical shift in the trade says Sandy Chim. Chim should know. He is CEO of Century Iron Mines (TSX:FER), a junior advancing a number of projects in Canada's north east, with a direct line to two of China's biggest names in mining and metals. 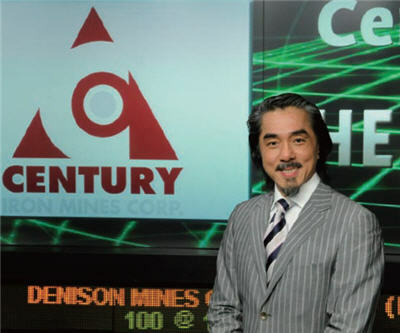 Century, also the largest holder of iron claims in Canada, is backed by Wuhan Steel and Minmetals, number 321 and 169 on the Fortune list of the world's 500 biggest companies. The iron ore futures market remains miniscule, Beijing's own trading platform matches very few trades and BHP's globalORE system has not made inroads either – although it is referred to as the spot price, iron ore is still mostly sold on a CIF or cost-insurance-freight basis. "Now, the trade is rapidly moving towards a real spot price. Thanks in part to stockpiling fewer and fewer deals are being done on the CIF price. You don't need to buy by the shipload anymore." The movement towards a true spot price brings with it much greater volatility says Chim. The transformation of the iron ore market over the last few years has been nothing less than stunning. Those with nerves of steel can now look forward to even higher highs and lower lows. >> Iron ore: Who let the bears out?